Note: Before I jump into this heavy topic first let me say happy belated New Year to you all. I hope that you had a great holiday season. Also, please excuse my absence. I started many awesome projects that I will be sharing with you soon at GuideWAH. First, let me say that the following article will not have anything to do with politics. However, there are lessons that we can all take away from the government shutdown that can impact our future. So let's jump in! The government shutdown served as an eye opener for many people in our country and those watching around the world. Nearly eight hundred thousand federal workers were forced to forgo their much-needed income for five whole weeks while Congress disagreed on appropriations of funds. So where does that leave almost a million workers without pay, families to feed, and bills to pay? There is a perception that when you hold a government position, it is the ultimate job security. Government employees along with others have long believed in this false idea of job security for ages. However, if you know my background of working with job seekers since 2007, you would know I would tell you the opposite. A company that I served as a Career Expert said it best, "every job is temporary." Yes, there is no such thing as job security. This entire event along with the downturn in the economy in 2007 shatters the stereotype that a federal job or any job for that matter is secure. In this most recent event, unfortunately, it took the most recent government shutdown for employees to realize that they are not untouchable. However, it is not just government employees. Business owners that rely on government contracts felt the heat as well. Again, the big difference here is that contractors didn't receive back pay. The shutdown served as a reality check as people had to sell their belongings, find alternative work after hours, and live in uncertainty for five weeks. Many maxed out credit cards, sought out loans, and asked family members for help. Others had to rely on voluntary assistance from churches, food pantries, and donations to make it through the horrific experience. Although the shutdown has come to an end and the workers received back pay, the impact of the loss that took place will not be forgotten. Credit scores, family heirlooms sold in desperate need, and loans from family or friends can't be resolved overnight; if ever. Here is a truth bomb. No matter how well we do our job, things inevitably change. For example, there are industry shifts, culture shifts; organizations lose funding and companies lose customers. Things happen that we can't control. What we have today can be gone tomorrow. Forget the politics of the shutdown, or who is right or wrong, because this site is not the place for that. The fact is that when we work for someone else, our future outlook is in the hands of another person. Depending on one source of income is a tremendous risk. If we are fired or laid off, our income can disappear overnight. If we work for someone else, we should always keep an open eye to the job market. We never know, if we aren't looking, when better opportunities exist. The best time to look for a job is when we are employed. When we aren't desperate, we can objectively evaluate an opportunity. We can weigh the pros and cons and make a thoughtful decision about how a new job might improve our professional and personal life. If we don't lose the position, we will already be in the game and won't have to start from scratch because we will know what is out there. You should always have a side hustle going. Even if it is more of a hobby than a business, that's okay. If you lose your job, it's a lot easier to ramp up a small venture than it is to start something new. And even if you don't lose your job, your side hustle can help you develop skills, talents, and connections that can pay off. Sometimes a side hustle can turn into a real thriving business. The biggest lesson learned from this experience that we as a nation had to witness, is that self-reliance is the most critical aspect of survival. To have security, one must have independence in the form of multiple streams of income. In the face of uncertainty, the best anecdote is being able to supply what we need for ourselves and our family. The cruel nature of such events happening in the future is enough to allow everyone to arm themselves with the necessary tools to survive. Don’t wait for the next shutdown or something similar to ruin your livelihood. My biggest advice is to act now and secure a future of self-reliance and independence. We are conscious of all of the additional expenses that generally occur during this time of year. For many of our readers, the kids are going back to school and the holiday season is just around the corner. This is why we decided to bring our readers tips for remote job searching during the Fall for customer service roles. We have listed a few work-from-home job opportunities that are open to applicants currently. Read on to discover more. Are there remote opportunities available during the Fall? Yes! This time of year is an excellent time to earn extra cash remotely. With the holiday season approaching, there are possibilities for you to score a work-from-home seasonal job as many companies need additional help this time of the year when shopping increases. Do you know what type of company hires the most remotely during this time? If you suspected retailers, you are right! Still interested? Keep reading. If you are looking for a remote opportunity in customer service this fall, we recommend scouting online job boards using words like “seasonal” and “remote.” We tried this exploring Indeed using these words, and this is what came up for us. There are a variety of companies who often hire remotely this time of the year. In fact, we know several businesses that are hiring currently. Take a look below to see if any of these opportunities are of interest to you. If you are curious, be sure to apply quickly as these opportunities will be filled soon. Williams-Sonoma is a specialty retailer company who specializes in home goods. They are known for hiring this time of the year. They are currently seeking Seasonal Customer Service Associates and Seasonal HR Assistants. Check out all of their current openings by clicking here. We spotted an impressive work-from-home position with VIPdesk Connect. This company provides outsource customer service solutions to many companies. They are currently hiring for their Chanel customer care program. They are in need of Seasonal Elite Customer Service Representatives. You can check out the posting for this position here. While you may be doing some shopping at Amazon for the holiday season, have you ever thought of working for them to make some extra cash? They have many work-from-home openings right now. Check out their positions by going here. As you can see, there are many opportunities to find a remote job position in customer service this Fall. We will let you know of any other opportunities we come across in various fields here. First, let me apologize for not creating content for a few months. Sometimes life has different plans for us. Going through a massive move and relocating an ill family member kept me busy. However, as things start to settle down, I thought it would be great to provide you suggestions on how to increase your income during the summer months. 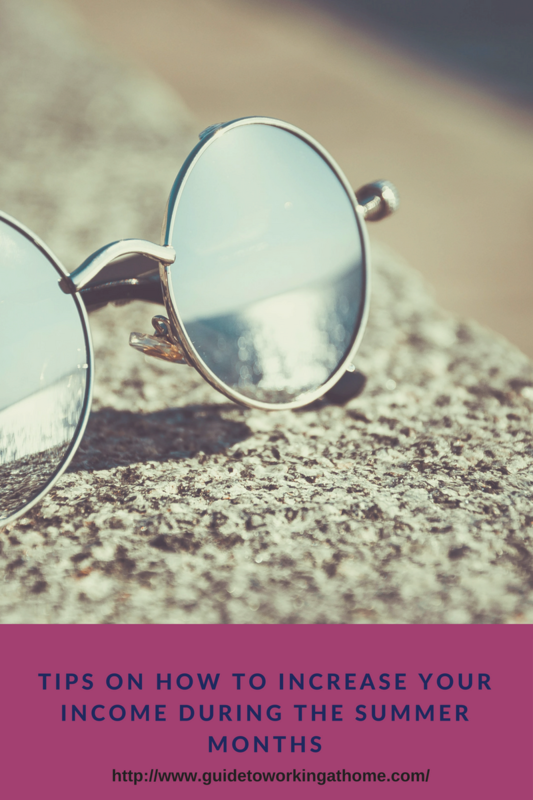 If you want to earn additional funds this summer but are unsure where to start this article is for you. This post is created to help you think outside the norm. 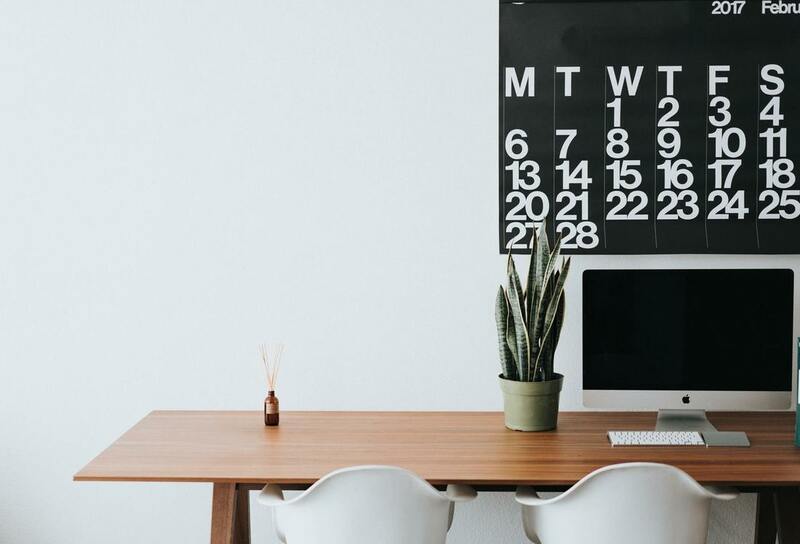 Whether your reason to work more during the summer is to pay off debt, save for a big purchase, retirement, travel, back to school expenses or just a cushion for a rainy day, I hope you find this information helpful. If you have a talent for writing and have topics that you can speak about, you should consider blogging. It’s simple to set up a website and get started. Bloggers can monetize their sites by affiliate marketing, providing ad space and offering services to their target market. To be successful and gain followers, you will need to be consistent with marketing and content creation. I am not saying this is easy. However, it has been a great and rewarding experience for me. A lot of people need help with daily tasks. People and businesses need extra help on a regular basis. By becoming a virtual assistant, you can help others with some of these tasks and make money in the process. You can find these types of jobs by checking this website and places like flexjobs.com. You can read more about flexjobs here. Do you have a bachelor’s degree and love children? If so, then you can teach English online to kids and sometimes adults. There are several websites like VIPKids and Cambly that are looking for you. You don’t need to move to another country to teach, and as long as you have a computer and internet access, you can do it from the comfort of your own home. You can find these types of jobs by checking this website and places like flexjobs.com. If you have skills that can be useful to others, consider putting it on Fiverr. Thousands of people are looking for someone to help them make their daily lives more productive. For example, if you have skills in writing, editing, marketing, and administrative tasks, why not earn some extra money while helping people at the same time? People are always looking for ways to expand their education. You can earn some extra money by creating an online course. Websites like Teachable.com allow users to create an online course that they can share with learners worldwide. You can make some extra money by just driving people around. If you have a car that is in decent shape, you may be able to drive for Uber and Lyft. Both platforms allow you to operate when and where you want to, and you can move your earnings into your bank account. Not everyone has a lot of time to grocery shop, and you can act as their shopper. Websites like Instacart allow users to submit a grocery order online. Then a shopper claims it and purchases their items and delivers them to the customer. You certainly won't get rich using survey apps. However, I have earned an extra 100 here and there just answering video questions using the app Voxpopme on the Apple device. I have a full review coming soon about my experience. However, you can check out Voxpopme beforehand here. Okay, friends, this is a bonus to help you earn or save extra money. Qapital has impressive features that allow you to set rules to automate your savings. I have personally saved thousands this year already using this phone app. You can find my full review here. The app is 100% free! Digit is another one of my favorite apps. It goes above and beyond to help you save. It studies your habits by paying attention to your income and spending, and it will keep your spare change in an account for you. The downfall is that after a period there will be a fee for the service $2.99 per month. You can read my full review here. Friends, this list is only the beginning. There are endless opportunities out there to earn extra funds during the summer season and throughout the year. We will continue to add more ways to this list. Now, I want to know some of your ways of earning additional cash. What’s your advice to those looking for ways but struggling? Let us know in the comments. If this content has been helpful, please consider making a tax-deductible donation to our friends at RE-Academy. Even a small donation of $1.00 can help their mission. They are a 501(c)(3) Nonprofit Organization whose purpose is to help empower people from underserved communities to achieve economic self-sufficiency by providing a network of support, professional coaching, development tools and a confidence boost to help them thrive in work and life. You can learn more here. 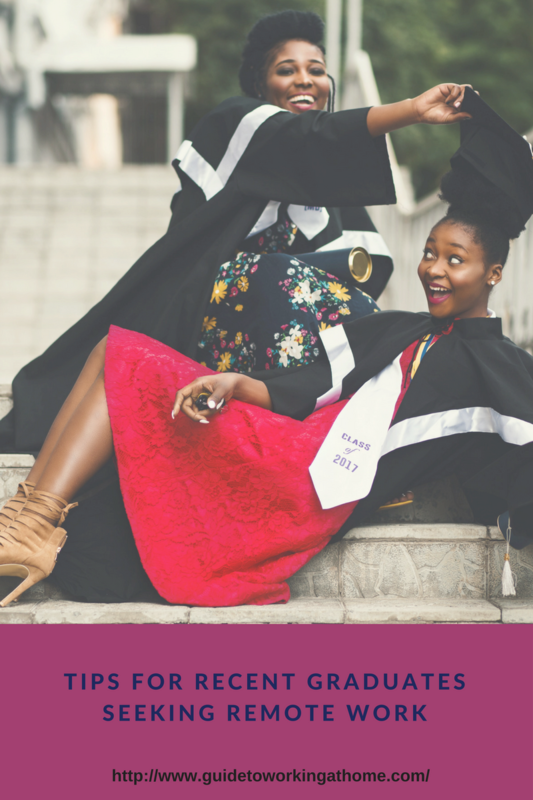 It is that time of year, commencement season! Congratulations to all the graduates as you take the next journey. It is the time to celebrate and consider your next phase in life. If you determined that the remote lifestyle is for you, please keep reading. As someone who is in the upper age range of millennials, I understand that we distinctively think of the workplace uniquely. We value elements such as flexibility, independence, creative freedom and professional growth. Honestly, we are probably the generation that anticipates these elements from employers the most. I remember when I first graduated from college remote job opportunities were rare. Of course, I managed, but I was never entirely happy. Today, I am delighted with the work I do. I can enjoy the flexibility of my work and have the creative outlet I crave. If you are having a hard time locating entry-level positions that offer the flexibility element you desire, I am here to help. 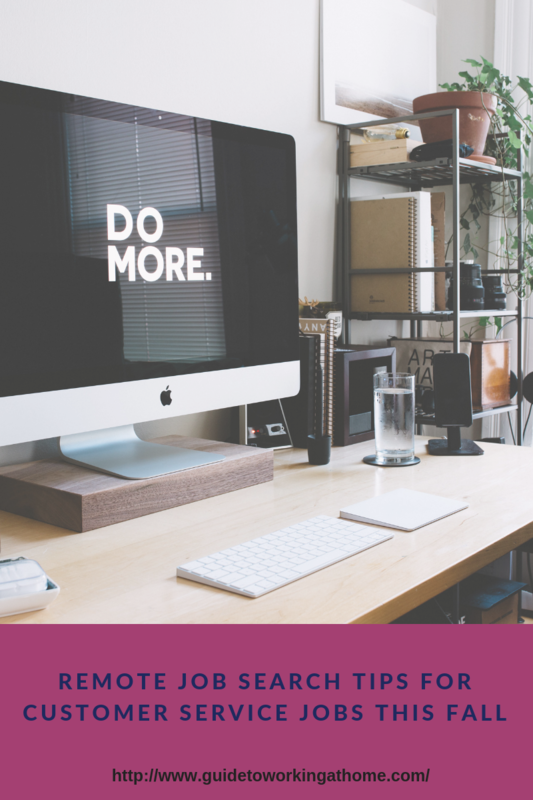 As a Workforce Development Strategist, I am fortunate to see all the incredible changes to the job market and expansion of the remote workforce. Here are a variety of jobs that can be remote and often have entry-level openings. In these roles, you will be working one-on-one or in groups with children or adults looking to master the English language. The requirements will vary depending on the company. However, a BS or BA degree and being a native English speaker can get you in the door. This role will allow you to teach from your home office. Sometimes virtual school teaching openings will consider first-time teachers with direct student teaching experience. However, you will need certification in the hiring state. If you are interested in writing and earned a degree in marketing, advertising or journalism, there are writing and editing positions that are remote. People in these roles develop content for blogs, websites, social media and magazines. It will be helpful to understand SEO and know the latest trends in digital marketing to be successful. I will continue to add to this list as we see more fitting entry-level roles for recent graduates. Congratulations to you all! If this content has been helpful, please consider making a tax-deductible donation to RE-Academy. Even a small donation of $1.00 can help their mission. They are a 501(c)(3) Nonprofit Organization whose purpose is to help empower people from underserved communities to achieve economic self-sufficiency by providing a network of support, professional coaching, development tools and a confidence boost to help them thrive in work and life. You can learn more here. ​Are you looking for work from home opportunities? Well, this is an event you don't want to miss. Our partners at My Employment Options are hosting their yearly online job fair Thursday, April 19th. This event is open to the general public. Where: This event takes place entirely online. You don’t have to be a current client of My Employment Options to attend. Please note there may be employers that only hire onsite workers or remote employees in particular states. You can sign up regardless of which state you reside. This event is brilliant because it allows you, as a job seeker to network online in "chat" rooms with recruiters from leading national employers that hire for home or onsite jobs. ​You will need to register for the job fair on their website and test your technology to make sure all is working correctly. Lastly, be sure to mark your calendar for Thursday, April 19th and get ready to network with some great companies. ​Learn more about My Employment Options here. If you have been following this website, you know that I am a productivity addict. Currently, I am an avid user of Asana, Pomodoro Method, and planners both digital and physical copies. We are approaching the third month of the year. 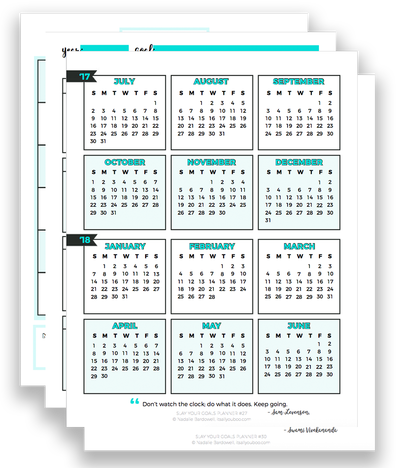 However, it's never too late to start planning your goals for the month, quarter or year. For me, I find that each month is a fantastic time to evaluate goals. I am involved with online groups and slack communities that encourage remote professionals to goal set each month. I can tell you that many people are benefiting from this activity. 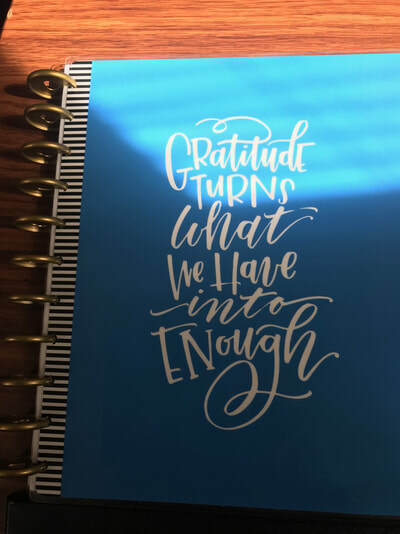 Okay, so I received access to this fabulous planner a month ago. You guys know I am very protective of the information I share with you. You can be sure any products and services I share I have tried them for a period beforehand. 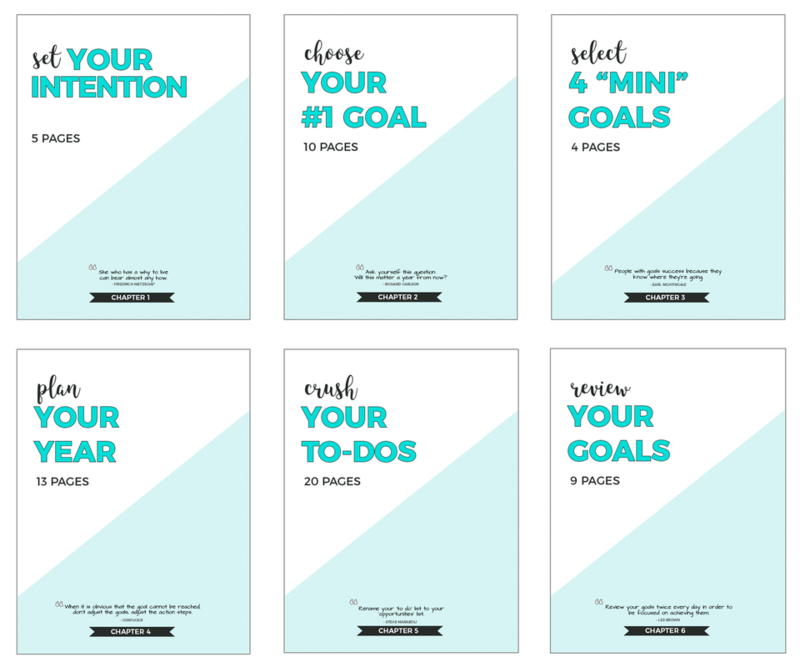 The Slay Your Goals Planner is unbelievable and has improved the way I set my goals. 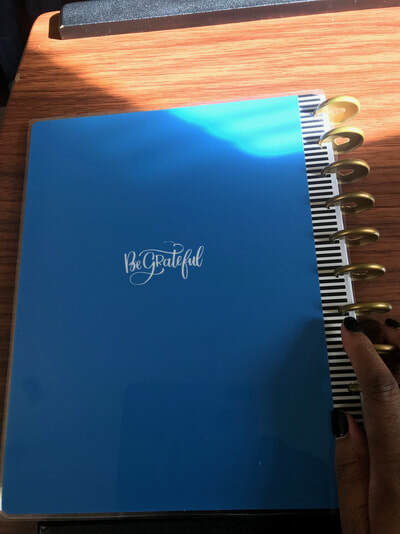 It is the most meticulous planner I have ever used, and I have tried many! 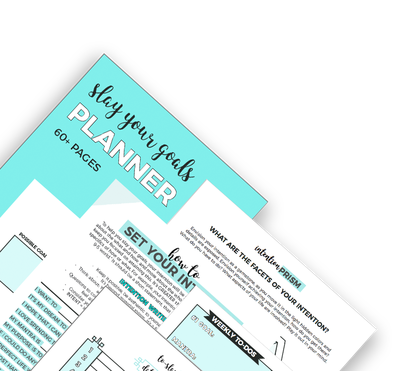 The planner takes you through intense goal planning sessions. However, the method is not overwhelming like other planners and programs. Each step of the planning process is beneficial and intentional. Currently, I use Asana and the Happy Planner for all projects and tasks. I utilize these tools for both business and personal life activity. 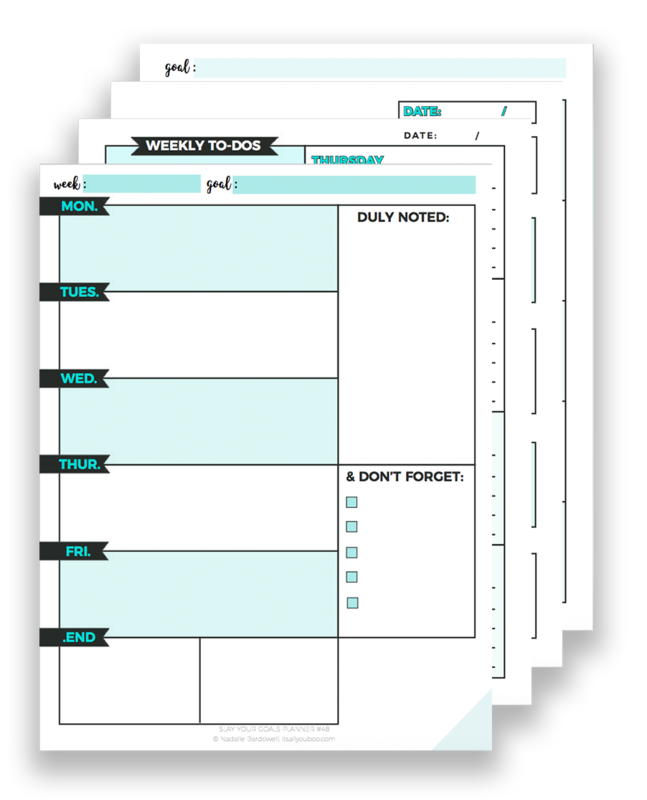 As some of you know, I teach productivity courses so I was worried about how this planner would fit into my current systems. I was mainly concerned about steps overlapping. 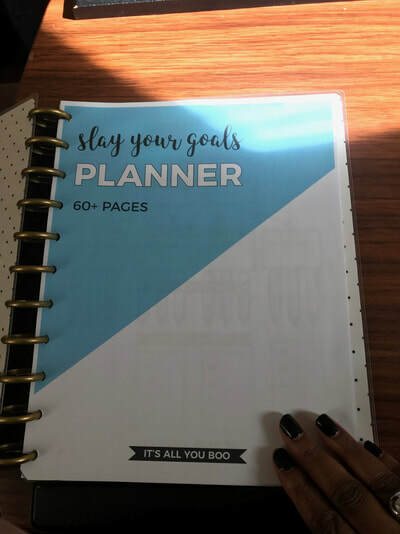 Well, the Slay Your Goals Planner worked well with my process. I am convinced that it would work with any system. I plan to continue to use my Happy Planner for day-to-day planning. 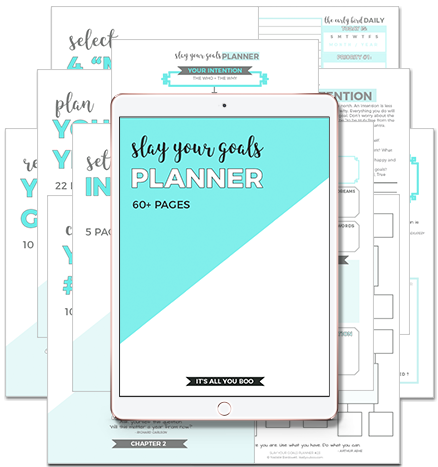 I will use the Slay Your Goals Planner along with Asana to focus on priorities and long-term goal planning. I will also use Asana and the Slay Goals Planner to determine how my days should be structured. The Slay Goal Planner will not interrupt the current system you use. Instead, it can improve your process! 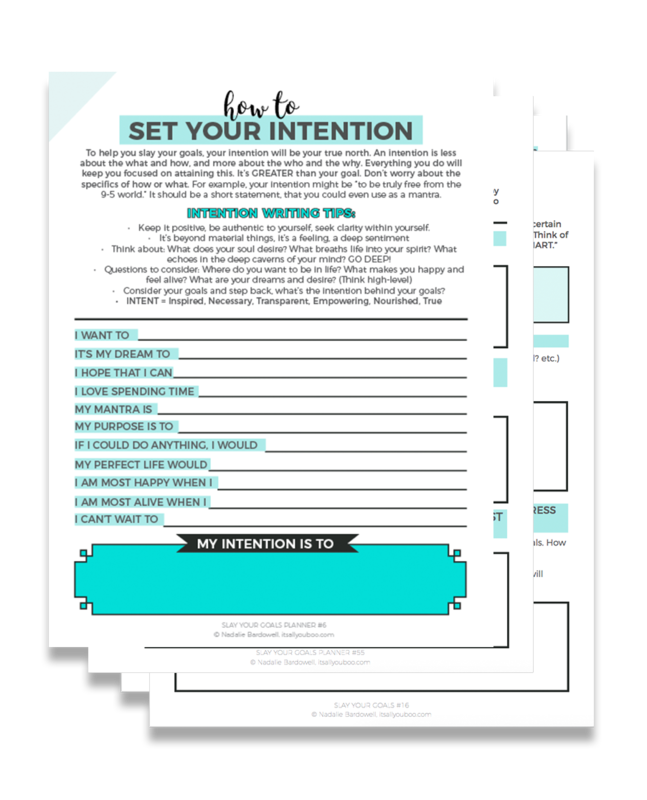 This planner begins with helping you with the process of determining your intentions. Afterwards, you will go into your goal planning. This planner is like having a coach in your ear guiding you. There is no reason why you wouldn't be able to goal plan efficiently unless you don't try. If you commit to this planner, you will pull out all the information you need to create a great game plan for the year. 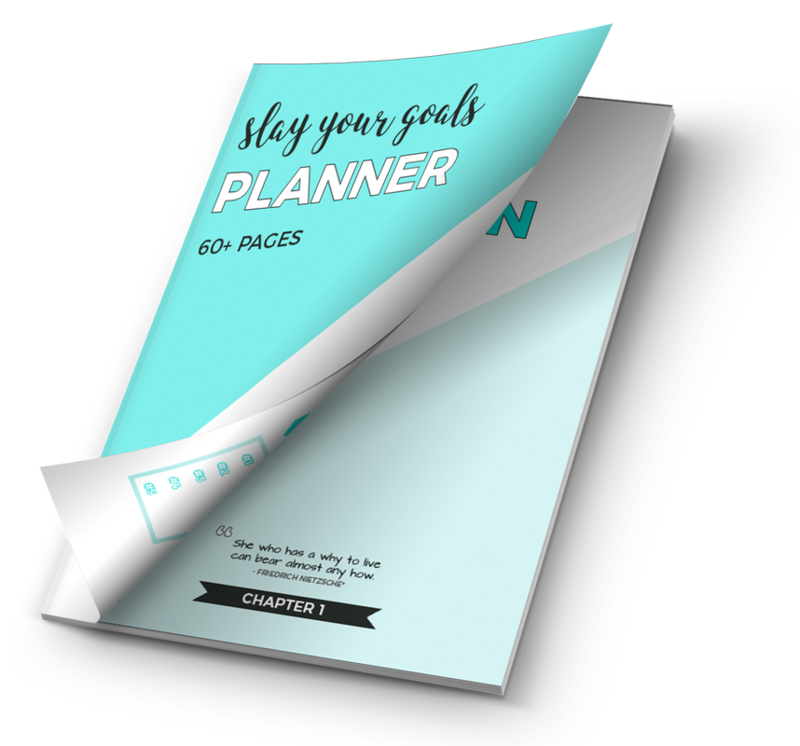 You can use the planner in various ways. For example, you can use it digitally. You can utilize it with the iPad Pro after adding it to your OneNote account with the apple pencil. If you don't have the iPad Pro, don't worry you can type directly into the planner using Adobe. Lastly, you can print out the planner for use. I use the Happy Planner hole puncher and rings to bind it together. Here is a picture of it. I love this planner! It has been an excellent tool for me this year. Trust me you will feel like a total boss after using it. If you are interested, you can use my affiliate link. It is never too late to start planning your best year yet. 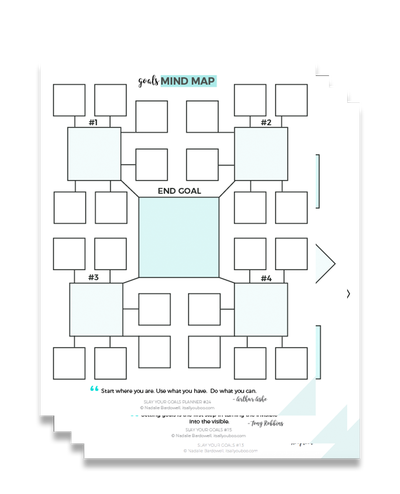 If you are still struggling with productivity, mindset and goal setting why not try it. 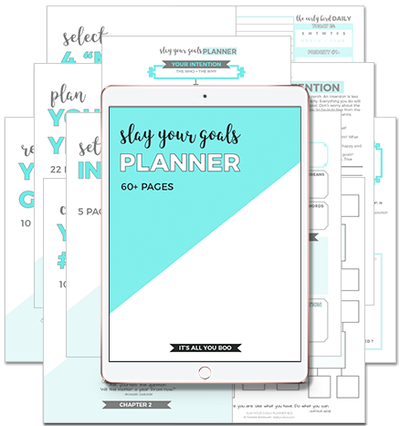 See what the Slay Your Goals Planner can do for you this year. If you decide to test out the planner, please let me know what you think of it. What is the Pomodoro Technique and How Can it Help Productivity? Some tips that will help you be as productive as possible when working at home with a checklist. If you are new to the world of working remotely or are not experienced working in co-working spaces, there is a good chance you aren’t familiar with the Pomodoro Technique. Since 2011, I have been working remotely, and I heard about the Pomodoro Technique but didn’t give it much thought. Goodness, that was a huge mistake. If you are anything like me, you probably created goals to improve your productivity this year. Even if you are good at being productive with your time it doesn’t hurt to see if you can develop it further. If you are struggling, you should consider the Pomodoro Technique. Yes, I have been using this method, and I can say with confidence that it works well for me and it can help you too. 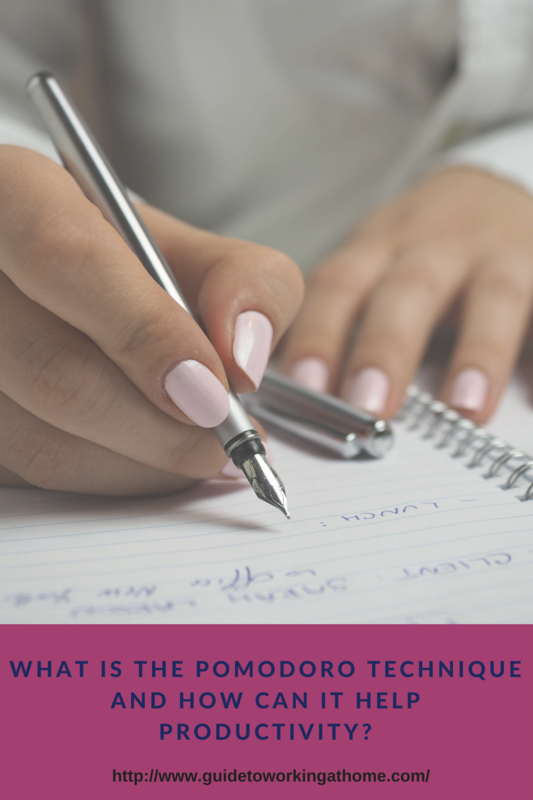 The Pomodoro Technique might sound complicated. However, it is straightforward. Here is why remote business owners and workers around the world are using this method and are experiencing excellent results. This impressive technique involves setting a timer or using a Pomodoro app for 25-minute work sessions. When the timer expires, you take a five-minute break. If you want to continue working, please don’t, instead, take a break. You can go for a walk, call a friend or grab a drink. Just make sure you break away from your tasks. 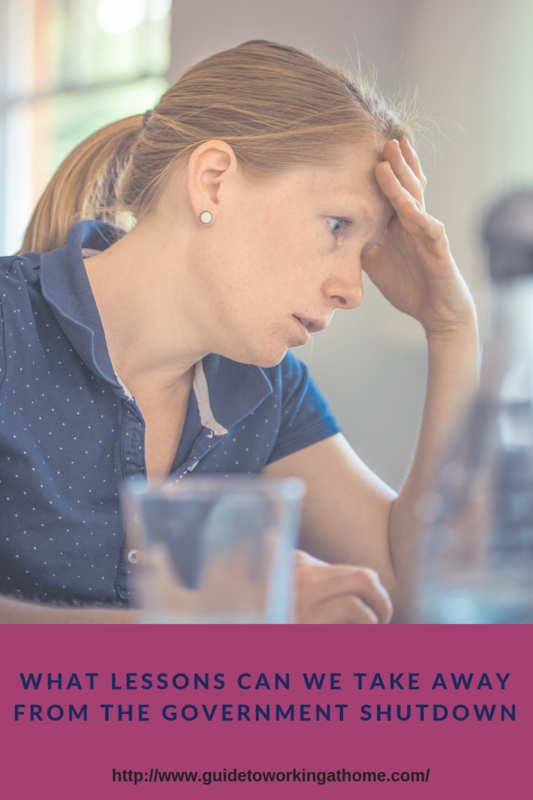 After you have done this cycle of 25 minutes work sessions with five-minute breaks four different times, you can increase the time off to 10, 15, 20 or 25 minutes. You can continue the work sessions until you complete the task. Practice goal setting with this technique. Write down what you hope to achieve during your work sessions before you start. Take some time to write down a few things that you accomplished during your 25 minutes session and take a five-minute break. I even suggest having a virtual coworking session with other remote friends to make this time even more productive, and goal set together. One of my tips is to write down what you achieved during your 25-minute work sessions. This step gives you a visual reminder of what was accomplished or not. 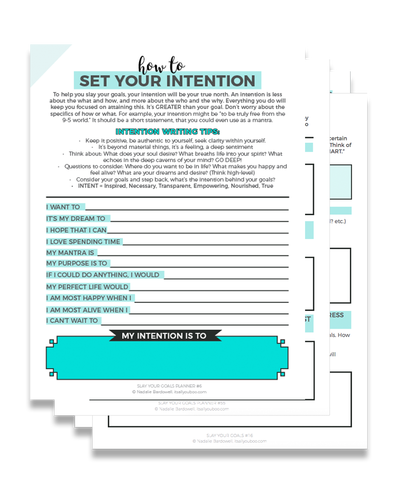 It is an excellent way to hold yourself accountable and can be what you need to remain motivated. Trust me you will be amazed at the amount of work you can accomplish. No matter how many assignments you need to accomplish, it can be challenging to remain productive. One of the ideas behind the Pomodoro Technique is that it doesn't matter what you are undertaking, you can focus on a task and be productive for 25 minutes at a time. Productivity can be crucial to accomplishing a massive task that seems overwhelming or a job that you have been putting off. We all have to deal with distractions especially when working remotely. Even if the disturbances are small, they can prove to be destructive for a task that you are trying to complete. The Pomodoro Technique can help you deal with these distractions effectively. Write down any interruptions that occur when you are in the middle of a 25-minute session. By writing these things down and not just trying to ignore them, it helps you to get them off your mind temporarily and decreases the impact that these distractions can have on you. Eliminate all possible distractions such as email, social media, pets, etc. You want to be able to place your attention on the tasks you want to achieve during the 25-minute sessions. When you take your 5-minute break, please use your time to give yourself a break from any type screen. This break means no to Facebook. Remember after four cycles of working for 25 minutes you should take an extended break. I am excited to share this productivity method with you. It has seriously changed my life, and it can do the same for you. Have you ever use the Pomodoro Technique? If so, what are your thoughts? If you haven’t, why not, find a fellow remote worker and try this out! Share your thoughts. Rita is a freelance writer, nonprofit founder, professor and flex work enthusiast who enjoys the freedom and flexibility of working remotely. After starting remote work in 2011, she has continued to work remotely and currently enjoys the flexibility. Today, Rita continues to embrace the remote work lifestyle and encourages others to do what they love on their own terms. 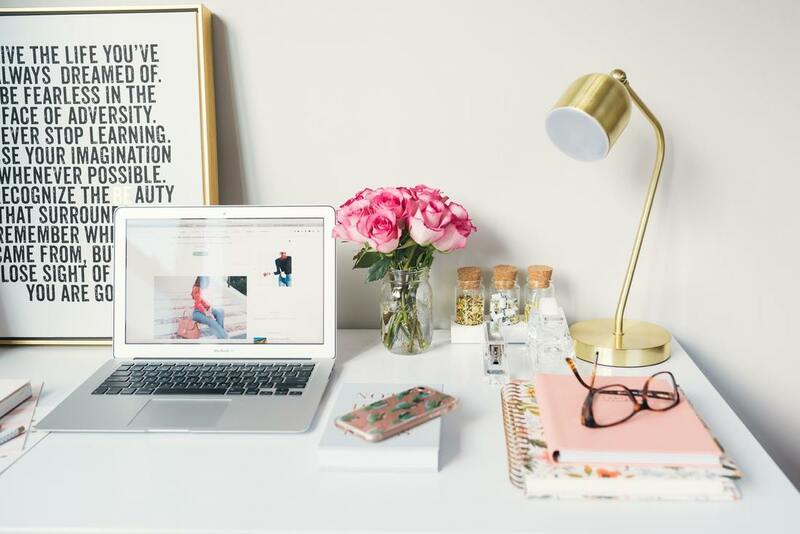 Be sure to follow the Guide to Working at Home where we share advice, jobs, tips for remote workers, freelancers, business owners to find flexible work and opportunities. Ideas and tips for discovering opportunities in higher education for professionals. Working remotely and from home can provide great work-life balance and an opportunity to be productive on your terms. However, when you work from home with children, it can be challenging at times. Distractions and interruptions can have an impact on your work performance. With a little forethought and planning, working at home with your little ones will be an awarding experience. Depending on the age of your child, scheduling may be difficult. Map out time and do your best to stay on track. Nap time for your child does not necessarily mean downtime for you. Make a list of daily tasks that need to get accomplished and outline out times when you can complete your goals. When you work from home or remotely, establishing a routine is best, but if you can't, a to-do list can be beneficial. If you are tech savvy, I suggest planning out your commitments in Asana. Designate a work area in your home. Your work area should be a place on the quiet side where you can organize your work, thoughts and have few interruptions. If the office has a door, even better! Your family will come to understand that when you are in your "office," you are working! The ultimate goal is to create an interruption-free zone. Set reasonable expectations for both you and your child. It may be unrealistic to expect your child to sit quietly for business hours. While coloring and screen entertainment have their place, they cannot be required to take the place of adult supervision and attention. You may need to adjust your work schedule to be in sync with the needs of your little one. You will need to understand that during the day, things may happen and you may fall behind in your work. Sometimes, you will need to stay up late to finish projects. You may find yourself tired during the day and need to squeeze in a power nap. If you have to work outside of your regular business hours, I advise trying to compensate by taking a few hours off the next day to make up for it. If your child is old enough, explain to them, in terms they can understand, that you are working. They may have difficulty understanding what work requires and what it means. However, when your children become older, they will have an opportunity to see hard work first hand from you. Working from home with children is by no means easy. Even if it seems crazy at first, over time through experience, reflection, and improvement, you can make it work! 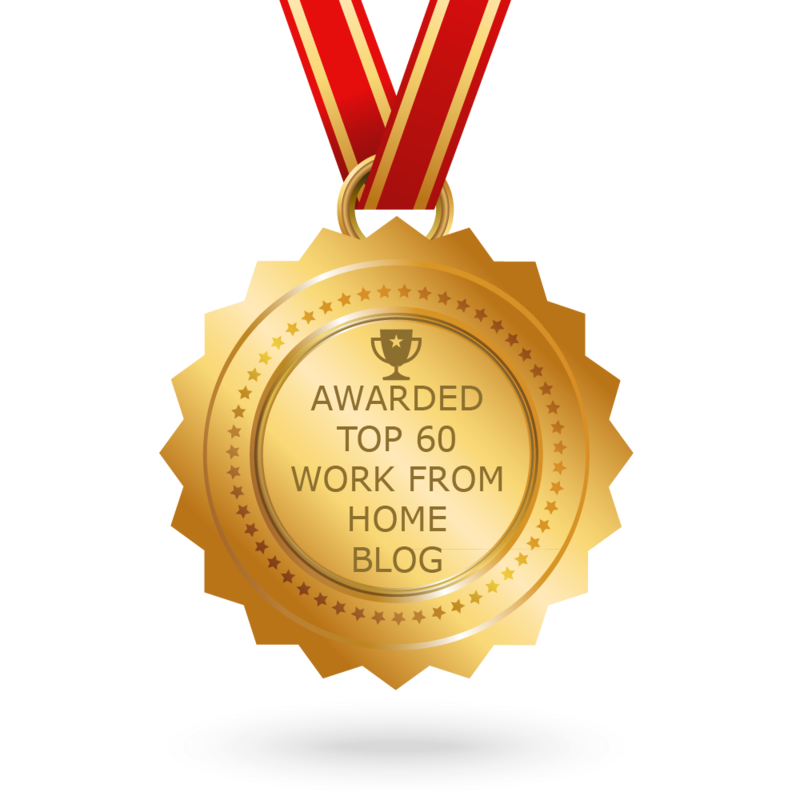 Are you currently working from home with children? 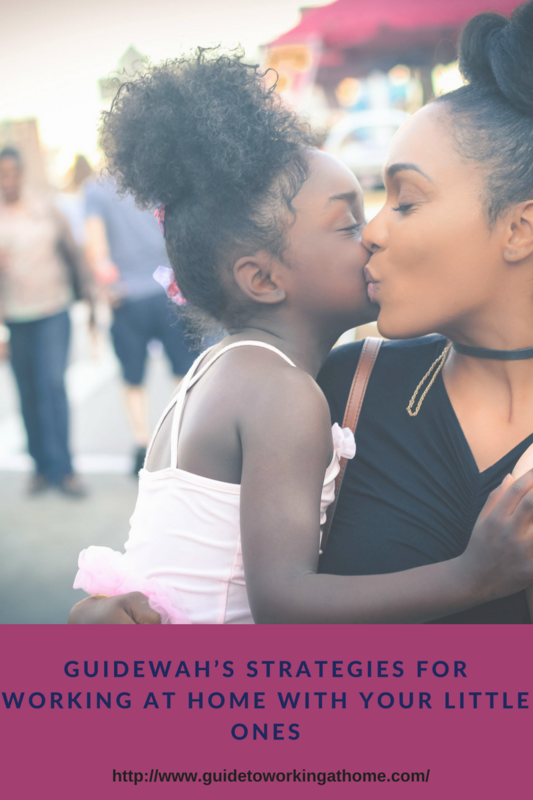 Is so, what steps are you taking to be productive with work and still care for your little ones? Rita is a freelance writer, consultant, professor and flex work enthusiast who enjoys the freedom and flexibility of working remotely. After starting remote work in 2011, she has continued to work remotely and currently enjoys the flexibility. Today, Rita continues to embrace the remote work lifestyle and encourages others to do what they love on their own terms. 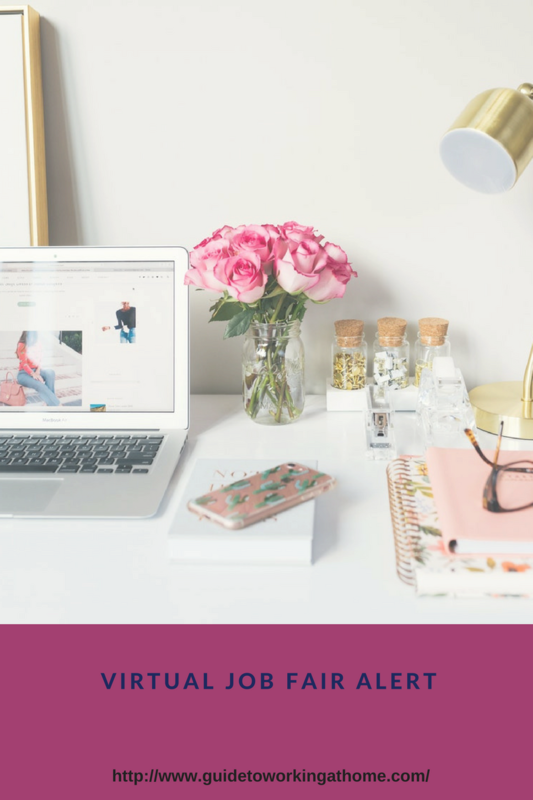 Be sure to follow the Guide to Working at Home where we share advice, jobs, tips for remote workers, freelancers, business owners to find flexible work and opportunities. Discovering ways to save or even earn additional cash can be daunting. 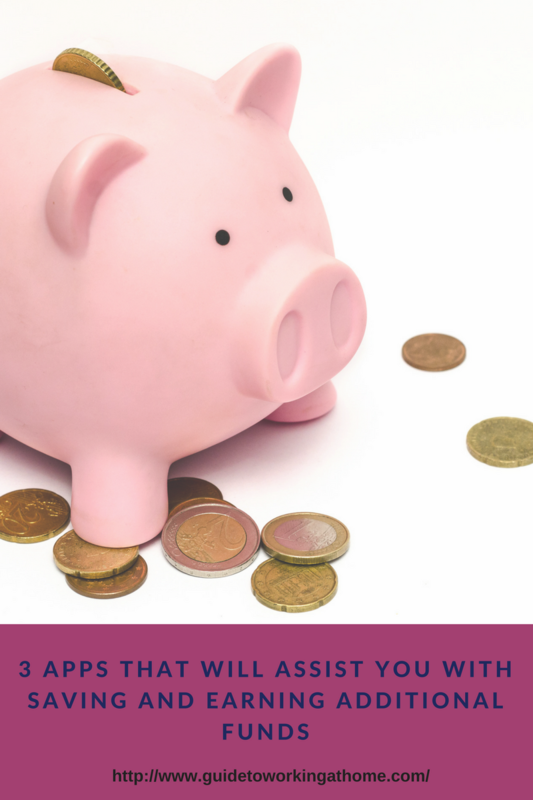 Whether you are looking to save money for your emergency fund or make a few more dollars to add to your financial goals, there are a few apps that can assist. Reaching your goals can seem impossible until you map out a system and strategy that lets you save and even earn additional funds while you are at it. The options we will cover today are various types of mobile apps that can help you save automatically and even earn a few extra buck by referring your friends. There are plenty of apps out there, but these three apps are ones that I used and has helped me reach my goals. I examined and utilized these applications for my purposes before creating my final recommendation list. I love this app for a few different reasons. Qapital has impressive features that allow you to set rule(s) to automate your savings. For instance, I have the app set up so that every time I spend money, the app will round the spare change and save it to my assigned goal. Right now I have a goal called “moving expenses” and "association fee fund." I also have a second rule that allows me to save a certain amount each month to help me reach my goals faster. The application is insured by the Federal Deposit Insurance Corp. To start saving with Qapital, you will need to connect an existing checking account to the app. They called this your funding account for the different goals you will create. Qapital also lets you automatically transfer funds into your account when you spend less than you budgeted for a particular expense or when you spend money on something you identified as a “guilty pleasure.” Or you can contribute a lump sum to your fund on a regular basis. The idea is that your money is moved automatically, so you’ll save up for your goals without having to remind yourself constantly. Once you meet your goals, you have a few options. You can request that Qapital transfer the funds back to your funding account. This process typically takes two business days; You can also obtain the Qapital debit card at no cost and use your money for the different goals you created by moving it to your spending account on Qapital. This method is automatic with no wait time. After saving money in my laptop replacement fund, I used the Qapital card to buy a new computer. The one great thing about Qapital is that there are no fees. You can expect to earn .1% on your account. Qapital will even give you five dollars to test it out. Try it out here. If you like the service, you can refer your friends and you both will get 5 dollars. Do you want to save and maybe earn extra money? Well, check out Acorns. Like Qapital, Acorns can round up purchases linked to your credit and debit cards, but the difference is that it will also invest for you. Yes, this means your money will be invested in a portfolio based on your goals and income level. Pretty awesome right? You can select options that range from conservative to aggressive. Since I am saving for the long term, I went with a more traditional choice. However, this service is not free like Qapital. You will need to pay a fee of $1 a month if your balance is under $5,000 and afterward you will be charged a fee of .25% of your total balance. However, if you are a college student and have a school email account, you can use the service for free. You can also make purchases with Acorns’ partners using the app, and these companies will invest in you by contributing a predetermined percentage of your purchase into your account. Remember Acorn is an investing account. You will see your funds change. It will go up and down. Keep in mind that it can take several days to withdraw your funds since you will likely have shares that would need to be sold first. Check out this app here and get 5 dollars to start with. If you refer someone, you both will get 5 dollars. I have to admit Digit is my favorite on the list. Unlike the prior two apps, Digit goes above and beyond to help you save. It studies your habits by paying attention to your income and spending, and it will keep your spare change in a savings account for you. It calculates what you can save because of its analysis process. You should expect savings from your account often with this app. If there is a day where the Digit app doesn’t collect for you, it will tell you the reason. How awesome is that? For example, it informed me that it was waiting for a few bills to clear before proceeding to save for me. Digit is FDIC insured. I love this app, but I do have a few suggestions. The amount saved from your funding account will vary, so you will need to keep an eye on your balance to avoid an overdraft. I also suggest setting up a minimum balance. For example, if your account is below $250 you can stop digit from saving from your checking account. You can earn a 1% saving bonus paid every three months. Also, there is a 100-day free trial period when you first start your account. The cost is 2.99 per month after your trial period. You can start here. If you refer a friend, you will receive 5 dollars. If you are wondering if I still use these applications, the answer is yes. I use all three, and they are still fabulous. Each one has its advantages. You may decide to test out one or all three of them. If you do, please let us know your thoughts. I hope this information has been helpful for you. If you are using other applications, let us know. Working from home means you have two parts of your life in one – the business and private life. 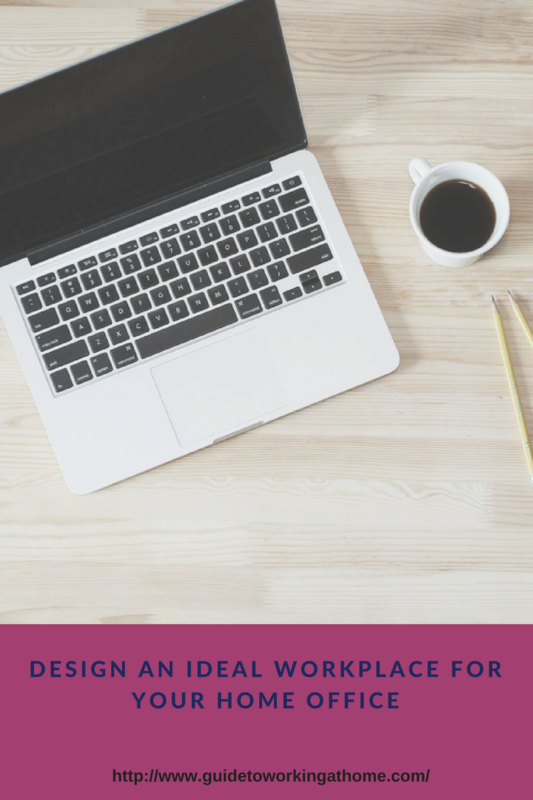 That means that designing a good office can help you separate those two spaces so you can entirely devote yourself to your business during working hours. Designing a home office is challenging because most home offices are a smaller size. Due to that, you have to find the perfect match between functionality and practicality. Organize your office space so that every part of the design has a purpose. Reserve one entire wall for shelves and storage so you can have everything you need in one place. The wall with your desk has to be clean from shelves, or you will create clutter on the desk. ​A desk should be your focal point. Everything revolves around the desk. That means that you should bring closer to the desk things you often use, like bags or camera, depending on your business. Other things, things you don’t use, move to the furthest wall in the office. Simplicity should be your inspiration. Furniture should be a light color, preferably white with clean lines. Avoid bulky furniture, or it will eat your office alive. If you don’t have clients coming in your office, remove extra chairs or coffee tables and focus entirely on your workspace. Having a small office is a good thing because it forces you to organize the entire space. Use light colors on the walls of white, light yellow or light gray and avoid dark colors like red, black or purple. Dark colors will make your office seem small and intimidating which will eventually affect your concentration. It doesn’t matter whether you have an office in your home or you have to travel to it, the main thing an office has to have is a pleasant work atmosphere. A home office beats an office in one building because you can design your home office just the way you like it. That is one big perk of having an office in your home, and you should use that perk entirely. Choose your wall color, your furniture and give a little bit of yourself in a design. You can do that with decorations or photos on the wall. A home office should feel like home. Mark is a foosball player who has a blog about foosball. He makes everything about foosball on his blog, including foosball history, records, rules, opinions, and reviews of foosball tables and parts you need to play foosball for ages. He is proud of the variety of foosball tables he reviewed, like, for example, Sportcraft foosball table brand. ​Readers: This page includes paid and affiliate links. Please note that we only promote advertising from companies that we feel we can legitimately recommend to our readers. See our disclosure policy for further information.